In line with its commitment to provide its fans and viewers the best possible customer service and experience, beIN MEDIA GROUP, the home of sports and entertainment in the Middle East and North Africa (MENA) has launched WhatsApp for business. The service, which is the first of its kind in Qatar, was launched by beIN to provide its viewers with instant technical support, customer and sales enquiries 24 hours a day, 7 days a week, across 23 countries in MENA. 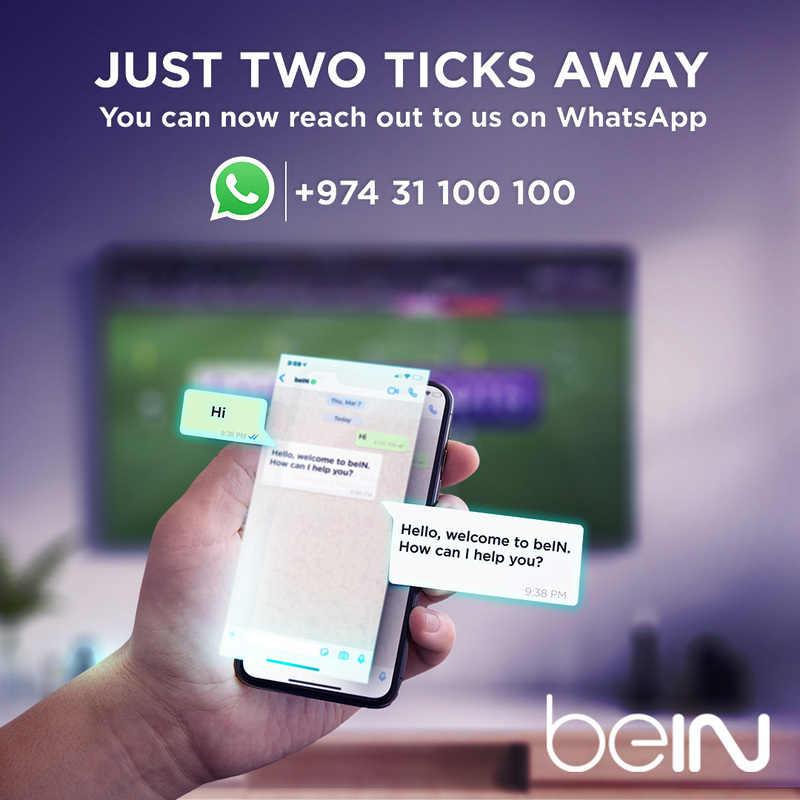 The WhatsApp service will also allow customers to renew their beIN subscriptions and upgrade their packages, making it easier than ever to enjoy the best of what beIN has to offer. To get in touch with a beIN customer service expert, send a WhatsApp message to the verified number +974 31 100 100. Commenting on the launch, beIN MEDIA GROUP’s Regional Sales Manager Hamad Al Jaber said: “We are very excited to be one of the very first companies in MENA to launch the WhatsApp for business service. beIN strives to provide viewers and fans first class customer service and support across the region. With this innovative WhatsApp service, our customers can now renew subscriptions, upgrade packages and ask any question they have 24 hours a day, 7 days a week by contacting one of our customer service experts on WhatsApp. With 97 channels hosting world renowned sports and entertainment content, beIN MEDIA GROUP is committed to expand its services and provide the best possible customer experience to its viewers all over the world. beIN entertains and operates in 43 countries globally, including 24 countries across the MENA region. With broadcast on satellite in 4K and Full HD, the beIN experience is also available on mobile, tablet, computer and other home devices through beIN CONNECT.